How can your organization harness the benefits of team building ? Where does Swazi Trails fit in ? Teambuilding is a valuable human resource management tool and is constantly growing in popularity with progressive corporate groups. Team building however, is NOT a miracle cure, nor “silver bullet” for problem-solving or raising organizational performance, but used correctly it can be an integral component, or the very foundation for getting it right. 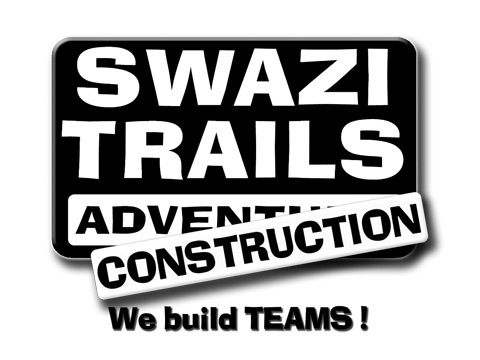 Understanding how, why and when teambuilding REALLY works is the key focus of our Swazi Trails mission: to shape better, healthier and less stressed teams. Coming together is a beginning, keeping together is progress, working together is success! Our experience in this field is that team building starts and finishes with COMMITMENT. The first commitment: is for both management & staff to make the time for regular team-building events. The second commitment: is for participants to make the most of the experience. The third commitment: is to carry that positive momentum back into the office… and to keep moving forward. How that COMMITMENT is demonstrated, practised and constantly communicated is where our Swazi Trails facilitation team can put heads together with you. We’re ready to engage with your team leaders, human resources management or even 3rd-party training or management consultants. We listen, we learn and we try to practise what we preach… to work with you as part of a team. This is involves attaching a particular message, to what is really just a fantastic fun day out. Often held as a ½ or one-day event, the focus here is on making your team feel good – individually and collectively. If you can laugh together…you can work together ! This involves a closer focus on skills development and cognizance of teamwork dynamics. Ideally suited to smaller groups, or a big group split into sub-groups, here our activities are designed to give teams the opportunity to put teamwork principles into practice. Better suited to overnight or multi-day activities, a skills-based or technical team build should be closely linked to an ongoing process within the organization conducted either internally or by a management consultant. The teambuild program can be structured to include “talk sessions” broken up by activity sessions to ensure lively thought, enthusiasm and active participation.